Stay in Costa Brava's best hotels! Featuring an outdoor pool, pool bar and fitness center, Hotel Delamar - Adults Only (+18) is located in Lloret de Mar, 164 feet from the nearest beach. There was a variety to choose from for both breakfast and dinner and the food was delicious! The beds were very comfortable. The hotel was very clean and very organized. The ambiance was great. Located in a beautiful and tranquil cove along the Costa Brava, this charming modern hotel is surrounded by pine trees and is adjacent to the beach. Dine in the restaurant with panoramic views. The staff, location and rooms at Hotel Hostalillo were even better than we expected! We had a nice upgrade (though many rooms do have ocean views), they made a really nice shower available to us after checkout time and the views of the bay and village of Tamariu are stunning. The beach is right there and the breakfast (huge and very good, with eggs and everything you could want) was excellent. The decor has been upgraded and was very fresh, tasteful and clean. Situated 220 yards from Platja Gran Beach, the 4-star Delfín offers a rooftop terrace with a hot tub and wonderful views of Tossa. Each spacious room has free Wi-Fi and a balcony. Everyone at the hotel was so welcoming. The staff at the desk, particularly the young gentleman from Girona, gave us advice about the town itself and nearby ventures. The food for breakfast was quite good with fresh croissants, fruit, eggs, breads , etc. the room was very clean and fresh looking. Ample space for both of us. We would definitely recommend staying there. The walk to the beach is five minutes. The view is gorgeous on beach and not too crowded at this time of year. Overlooking the Costa Brava headland of Cap Roig, Park Hotel San Jorge & Spa offers direct access to Bella Dona and Cap Roig Coves. It features an outdoor pool, spa and a free WiFi throughout. Excellent hotel in a beautiful location right on the sea with a fabulous outlook. 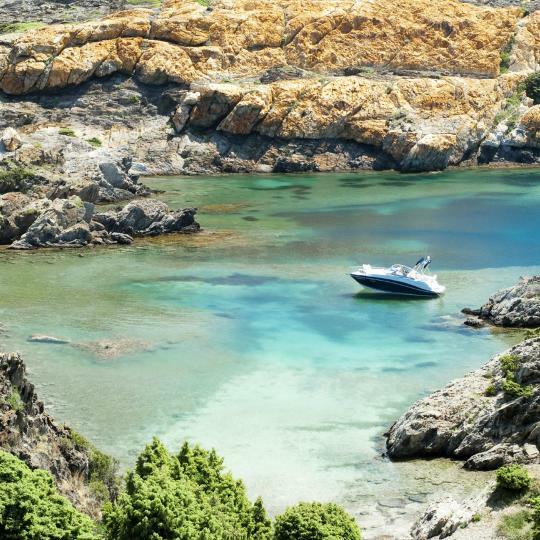 Hotel Sol Ixent is set in the beautiful Cap de Creus Natural Park, overlooking the Mediterranean Sea. It features a seasonal outdoor pool, contemporary design and rooms with a flat-screen TV. Great food and great location. We loved it! Located in L'Escala, HOTEL TORRENT offers a terrace. With a shared lounge, the property also has a bar. Rooms are equipped with a flat-screen TV with satellite channels. Great hotel, friendly welcome, would definitely stay again. Breakfast was good and its in a great location close to all amenities and the beach. Located in Begur, Alta House Begur has a garden and terrace. This 3-star hotel features free WiFi and a bar. Guests can chill out in the outdoor swimming pool. breakfast was a nice European bed and breakfast. Featuring an outdoor swimming pool and a restaurant, ROSAMAR ES BLAU is located in Lloret de Mar, 328 feet from the beach. Available for guests is a spa center, with a hot tub and a sauna. We arived at the hotel on a Friday at about 10pm and even that the dinner was over they gave us a cold dinner. The room was spacious and clean. Food was excellent, there was fresh seafood, paella...you name it. They even had Cava in the mornings. They were kind enough to give us 3 free entries at the hotel's spa, which was very nice and relaxing. Overall it was a excellent experience. Hotel Papibou is set in a renovated 13th-century building in the Medieval village of Peratallada, 15 minutes’ drive from the Costa Brava. It offers free Wi-Fi and free parking nearby. La Malcontenta is set in a restored, 19th-century, country mansion near Palamós, on the Costa Brava. It has an outdoor swimming pool, free Wi-Fi and free parking. Hotel was beautiful, staff were amazing and the location was ideal! Hostal Blau is a charming guest house set in a 14th-century town house in the Medieval village of Peratallada. This rustic property features individually decorated rooms and a terrace. 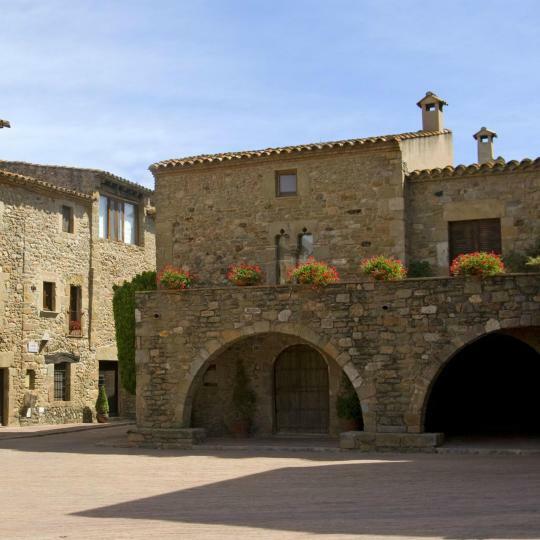 Peratallada is an amazing small medieval village and Hotel Blau is right in the middle of it. This traditional, 16th-century house is in the middle of Sant Feliu de Boada, in the beautiful Baix Empordà area of Catalonia between Pals and Peratallada. A delicious breakfast is available. The hotel was very unique with a really nice and welcoming atmosphere. Located in L'Escala, HOTEL TORRENT offers a terrace. With a shared lounge, the property also has a bar. Rooms are equipped with a flat-screen TV with satellite channels. Great hotel, friendly welcome, would definitely stay again. Located in Viladamat, Hotel Can Dispès features a seasonal outdoor swimming pool, garden, terrace, and free WiFi. The tour desk is available to assist guests in planning their days out. Absolutely beautiful place. Such attention to detail by the owners. Located in Palamós and next to Palamos Beach, Hotel Marina features air-conditioned rooms with free WiFi throughout the property. Guests can enjoy the on-site bar. Remodeled last year... like new and USB ports in room for charging. Empúries is set in a restored building overlooking the Mediterranean from a secluded beach. It is located nearby Empuries Archaeological Site and is a 5-minute drive from L’Escala, on the Costa Brava.... Stayed 3 nights and had a great time. A small little gem on the Costa Brava coast. The historic Hotel Trias is in front of Palamós Beach, a 3-minute walk from the town’s fishing harbor. It offers free Wi-Fi and an outdoor pool with wonderful Costa Brava views. Uhmmm, what's not to like about the property? Hotel Trias is amazing! Featuring free WiFi, Prestige Mar y Sol is set in Roses, 1640 feet from Ciutadella Roses and 1.4 mi from Aquabrava Water Park. This 3-star hotel has air-conditioned rooms with a private bathroom. The location directly across the street from the beach was awesome. Parking was easy. This hotel is located just outside Sant Feliu de Guixols, on a peninsula surrounded by the Mediterranean Sea. It offers free WiFi, indoor and outdoor pools and air-conditioned rooms with a balcony. I liked the night host who treated us like royalty when we arrived. 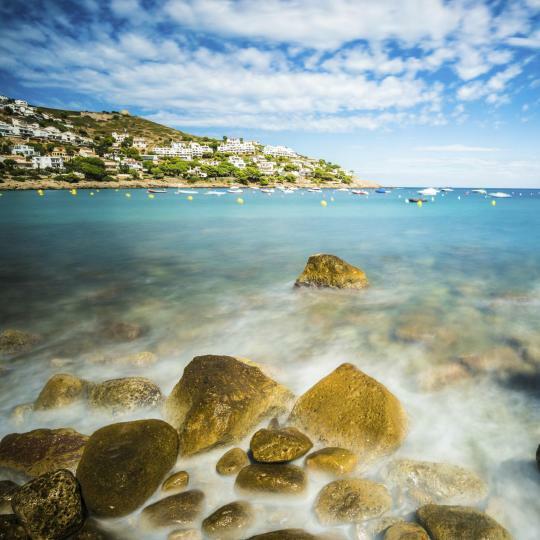 This smart hotel enjoys a privileged setting in the charming fishing town of Cadaqués the home of Salvador Dalí, on the beautiful Costa Brava coastline. Hotel in a good location, a couple of streets back from the beach promenade and shops. Located in La Bisbal, 21 mi from Lloret de Mar, Hotel Mar de Tasmània features air-conditioned rooms with free WiFi throughout the property. Great hotel, wonderful location, the staff was amazing. 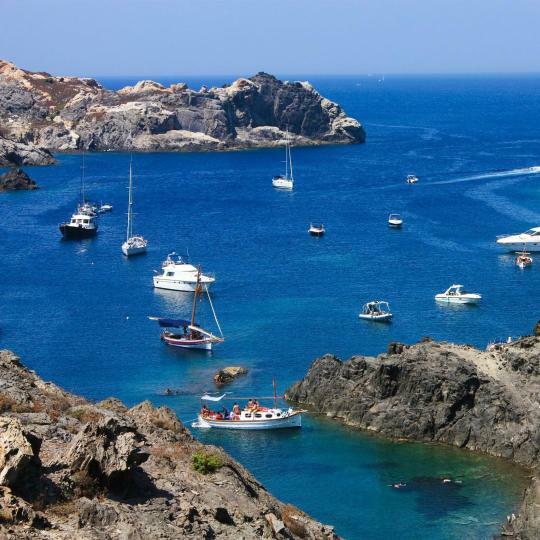 Go scuba diving in the Illes Medes, try snorkelling and kayaking through caves in Cala Montgo, or practice kitesurfing in Sant Pere Pescador! 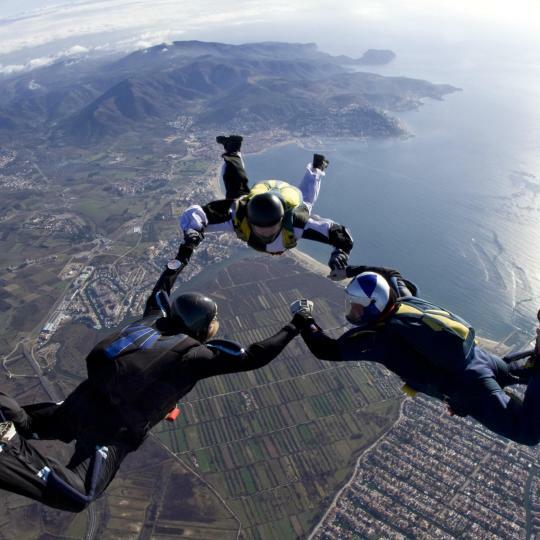 Skydive Empuriabrava offers aerial entertainment including skydiving courses, therapeutic jumps, hot air balloon rides, or the experience of flying in a wind tunnel. 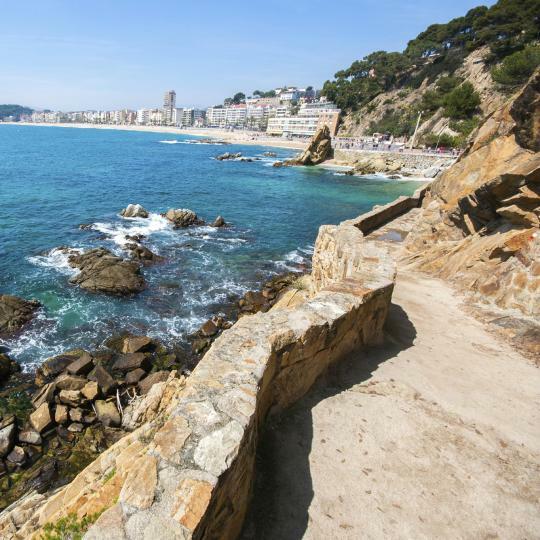 Originally used for catching smugglers, this series of interconnected trails spans the Costa Brava, from the French border to Blanes. Experience the stunningly surreal Dalí museum in Figueres, and visit the artist's former house in the charming fishing village of Cadaques. Famous for its mouth-wateringly fresh anchovy specialities, L'Escala's charming seafront restaurants offer some of the area's most exquisite seafood. Delightful and secretive coves, crystal-clear water and stunning rock formations await you at mainland Spain's most easterly point. The towns of Pals, Monells and Peratallada exhibit the beautiful architecture of medieval towers, bridges and castles. 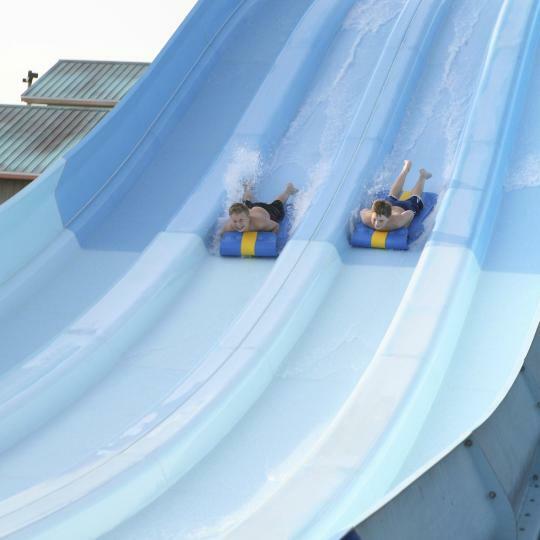 Located in Roses, this water park boasts 18 different rides of varying intensity, providing enjoyment for the whole family. These ancient fortifications were declared a National Historic Monument in 1931, and overlook the charming medieval town of Tossa. 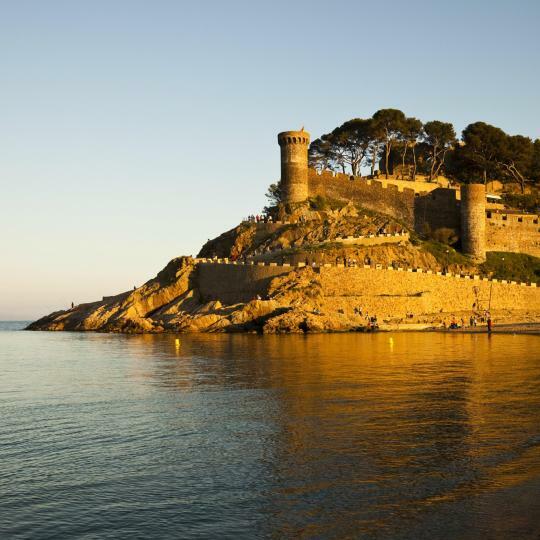 Let your hair down in Lloret, or enjoy a classy night out in the medieval hilltop town of Begur. Elsa at the front desk was so incredibly nice! My partner had an emergency back home to go back to and Elsa made sure that I visited the best locations and even let me check in later. The location is perfect and parking is free. I truly enjoyed walking and running the Camí de Ronda, which starts right by the hotel and takes you along the most gorgeous platjas, coves, and just beautiful scenery. If I was to visit Costa Brava again, I'd stay here again. Excellent location, 5 mins from the beachfront. Had a room in a building across from the main building, and loved it! Rooms look new, there's an elevator and excellent facilities. Very good breakfast, lots of options for both coffee-and-croissant and eggs-and-bacon type of person :) Big free public parking lot nearby, no need to pay for hotel parking if you can find a spot there. Would definitely stay again, as Roses is such a lovely Costa Brava town! Wonderful boutique hotel recently refurbished. Rooms are clean and comfortable. The hotel is less than a minute from the beach with many other beaches, restaurants, and shopping all within walking distance. Matthew and his wife Mariona who run the hotel and the restaurant couldn’t have been nicer with helpful tips about where to go and what to see in Costa Brava. We had a wonderful time and would not hesitate to return. Very highly recommend! Perfect location in a magical town in beautiful Catalan on the Costa Brava- home to the one and only Dali. Hotel is on the beach, 10 minute stroll to city center with fabulous restaurants, tapas bars--outstanding seafood . 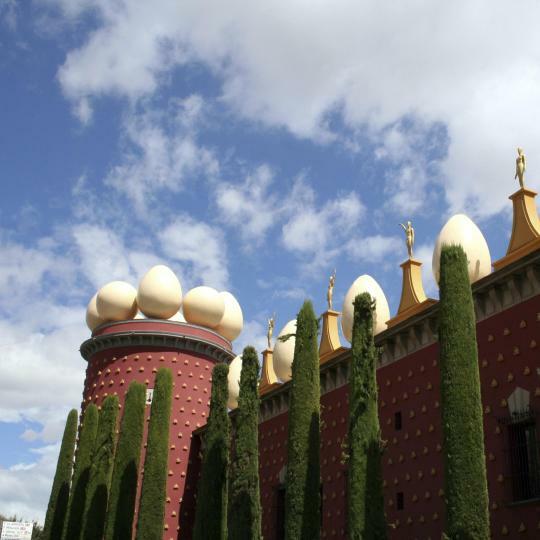 Dali's home is nearby and his amazing museum 45 minute drive to Figueres. Museum is a must see at night with a guided tour. Many wineries are a short drive from the hotel. Very family friendly! The location is amazing - beach is right under the hotel and most rooms have an amazing view. Also a very short walk to the town's main Street for all the shopping and restaurants. Very close to highway and driving to any Costa Brava attraction. The staff was extremely helpful and accommodating any request or question. We loved this hotel so much we stayed a second night. It was clean, modern, comfortable, and quiet. The staff were friendly and helpful. Our room had a terrace, no view, and felt like a hideaway. We spent more than a week in Costa Brava walking the coast and checking out the villages. This was our favorite spot. 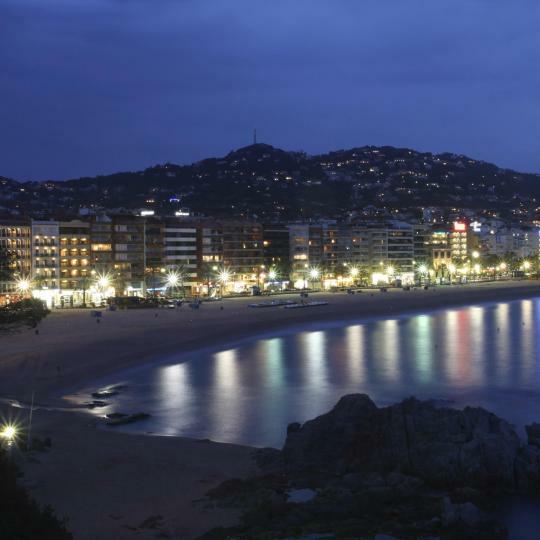 Hotel Mas Centre, in Lloret de Mar, Spain, is staffed by a competent, caring staff that keep the premises spotlessly clean and who keep the customers satisfied. It is a secure, no-frills, Spartan hostelry, which I highly recommend to those seeking value for their dollar on the Costa Brava. Spectacular hotel right by one of the most beautiful coves in all of Costa Brava. Restaurant was unbelievably delicious, ingredients were some of the freshest of our stay in Spain. Property was terrific, bar was great, staff was very helpful. Would recommend to any friends in an instant. Facilities are good and the staff friendly, Poor breakfast, just a lot of cakes and croissants, no solid food. After comparing to other locations across la costa brava it was quite over priced. There were 3 star hotels with pool etc at the same price or cheaper. From the moment we stepped on the property the experience at this hotel was exceptional. The staff was friendly and efficient and met our every request and need. This is the only place I will stay in this charming location on the Costa Brava! Stayed 3 nights and had a great time. A small little gem on the Costa Brava coast. The sea views were fantastic and the sound of the waves 24/7 a joy for my brainwaves. I loved the Spa: excellent facilities and clean. Stayed only 2 nights during our trip through Costa Brava and wish we could stay longer. Liked modern decor rooms, friendly staff, especially the breakfast crew. Would stay again if we ever visit this area. Beautifully located on Costa Brava, with very large sea water pool and many options for lounging and swimming in the sea. Good food, friendly staff, helpful and made every effort to fill our requests. Great value for the price! Great room for family. I cannot understand why this is one star hotel. This was better than many three star hotels we stayed at in costa brava! Great location, fabulous breakfast, nice ocean views from lounges and dining areas. Perfect middle spot from Barcelona to Costa Brava/France. Location was fantastic and staff excellent. I would definitely stay here if going to the Costa Brava. Best hotel in Llafranc! Location, quality of facilities and service was superb. Excellent place to spend some days in the jewel of Costa Brava. Really amazing place, highly recommended. And great for exploring Costa Brava as well. Everything one might need is there, note we were staying off-season so all restaurants and supermarket, pool were closed. But we saw football-pitch, tenniscourt, big hall with gym, pooltables, table-tennis and more all very spacious. The pool-area is fantastic looking surounded by palm-trees. several restaurants were being re-constructed and made ready for the season.